How do you manage your endless task list? What do you do to manage your time and the billion tasks that life seems to generates? Got any tips/tricks/tools? For the current game I’m working on, I use a giant Excel spreadsheet for the main tasks, and a mini todo list (in Notepad) of my current sub-tasks/notes. Plus I have a backlog of “nice to have but will probably never add” features. I know some people probably use online tools but I don’t need to collaborate so it would just slow me down, especially if my Internet connection was being crap, which happens reasonably often. 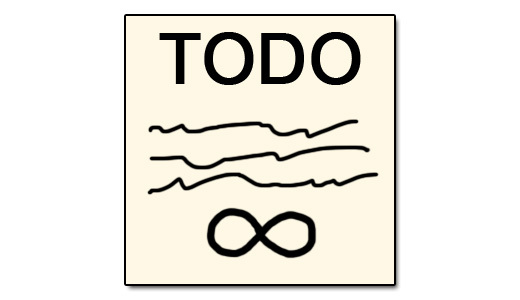 For biz dev I keep a backlog (in Notepad) of tasks I could do if I could be bothered, but they often aren’t that important. But I have to note them down just for my sanity. It keeps my head clear so I can stay focused on the priorities. I keep similar lists for personal/fun things, household improvements etc. For my main day to day important biz/personal/household tasks I used to just keep them on a prioritised todo list, noting deadlines if applicable. But now I’m trying a new method where I basically schedule those tasks on a calendar because I read that it’s less stressful than just having a giant to do list. Also I’ve tried to set up “themed” days; so like Monday is for biz dev/admin + planning, and the rest of the week is solid game dev work (and I’ll probably sub-divide that into coding days and design/communicating with artists days). Sunday will be for personal/household-related tasks. I’ve done something like this before and it worked well but recently I fell into a kind of “fire fighting” mode which just leaves me feeling stressed and like I’m not making progress on all the important things, so I wanted to fix that. I don’t use my email program to hold tasks. I like to have a zero inbox. I also don’t leave my email program open and I have turned off notifications. Emails can be very distracting when you are trying to focus on a task, so I’d rather be in control of when I check and process them. I also unsubscribed from a zillion email newsletters and social media notifications a few years ago and don’t get too much spam. Plus I try to keep replies quick. However, I always reply to customers but I ignore all of those “we can promote your game/buy our mobile ad system” emails and other similar time-wasters. So yeah. That’s how I pretty much manage things. How about you? 2) Miraculously I finish bang on time with no loose ends. 3) I overrun by anywhere from a small to very large amount. I have found option 3 to be the most common in development with myself in the past and with other developers that I’ve hired or been in contact with. One important thing to realise with deadlines is who set it. If it’s some date that a manager pulled out of a hat for you, you could be in trouble…If it’s a date that you set yourself then how did you arrive at that date? Did you just say “Yeah June sounds good, I’ll do it by then” or did you make a comprehensive plan overviewing all areas of the project and then assign time estimates (this takes experience by the way) to each part and then add on some contingency time before arriving at a viable date? Hopefully it was the second one. If you have been handed a date on plate by a third party (could even be a client) then make a plan, assign estimates and work out if you can complete the project on time. If not, then speak to them and ask what they want to remove from the project or if they want to change the date – it’s no use asking for an “extension”, school-project-style, the day before the project is due to be delivered (or worse still, not even contacting them and just being late). OK so you’ve got a plan and a viable date, now how do you make sure that you finish on time? Sure, you could just work on the project a set amount of hours each day, dealing with problems as they arise and adding little extras here and there and then … oops you’ve missed the deadline. Why? Because all the unforseen problems and additional extras gradually padded the project out by weeks until you missed the deadline by a mile. This is where Milestones come in. You look at your plan and use your time estimates to work out what you should have completed by Friday at the end of the first week. Then you repeat for all the other weeks in the project timescale. Then you start programming and if you haven’t hit your milestone by the Friday then you work all weekend until you have hit your milestone. It’s no use thinking that you’ll catch up later when some piece of work takes less time that you thought because it *never* happens (OK I’ll concede that if you are lucky, it *sometimes* happens). So OK, how can you avoid working at the weekend every week as that’s not particularly desirable? Well you need to put the most effort in at the start of the week so that you finish on time or even early! If you finish early, then what? Well you could get a head start on the next piece of work or you could go back over the last week’s work and add some more polish – after all, if you are making a game, polish sells! Here’s a key point, if you get a bright idea halfway through the week don’t start to implement it immediately or you’ll fall behind. Make a note of all such “polish” ideas and see if there is time to put them in at the *end* of the week. Or, at the end of the project, if you have any time left (haha), you may be able to put some more polish items in then or you may be able to talk to the manager/customer and see if they even want the polish items – because sometimes they won’t as they just want the project delivered on time. 1) Before making a commitment to a date, make an overview plan detailing each section of the project and attach time estimates to it. Then you know if the date is viable. 2) Set milestones based on your plan and time estimates. 3) Work hard at the start of the week (or better still, *all* week long) and make sure that you meet your milestone. 4) If you finish early, add some extra polish or get a head start on next week’s work. 5) If you miss the milestone, catch up right now, you cannot afford to let the lateness compound. 6) Note down polish items, ideas etc throughout the project and see if there is time to do them at the end or talk to the manager/customer and see if they even want them! You are currently browsing the archives for the Organisational Tips category.